NEW DELHI: As Gujarat went to polls in the first phase today, the Election Commission of India (ECI) released a data of the number of Electronic Voting Machines (EVMs) and VVPATs used in all 24,689 polling stations. An EVM consists of two Units – a Control Unit and a Balloting Unit – joined by a five-metre cable. The Control Unit is with the Presiding Officer or a Polling Officer and the Balloting Unit is placed inside the voting compartment. Addressing the issue of malfunctioning EVMs, Bhavnagar’s Deputy Electoral Officer, Yogesh Thakkar told ANI that no such issues were reported. “Some EVMs were replaced due to errors. 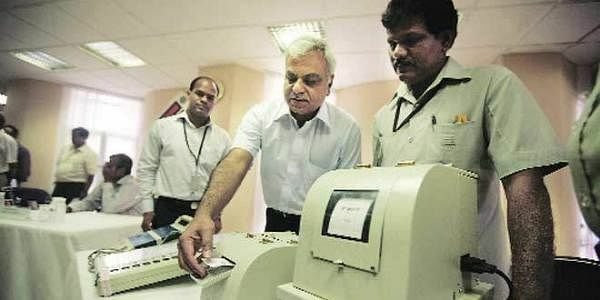 EVMs were updated with VVPATs, which allows people to verify their vote for 7 seconds,” he added. The voting for the first phase ends at 5:00 pm today, while the second phase will be held on December 14.